Any and all features in images are in active development. As development continues, they may appear slightly different in the final release. Institutional administrators will have access to a beta environment before the public release to help prepare for the change. As mentioned in our communications sent out early last month, coming in mid-March, we at Interfolio are releasing some user interfaces changes to all of our Interfolio products. This common dashboard will unify our products and ease the transition from platform to platform. 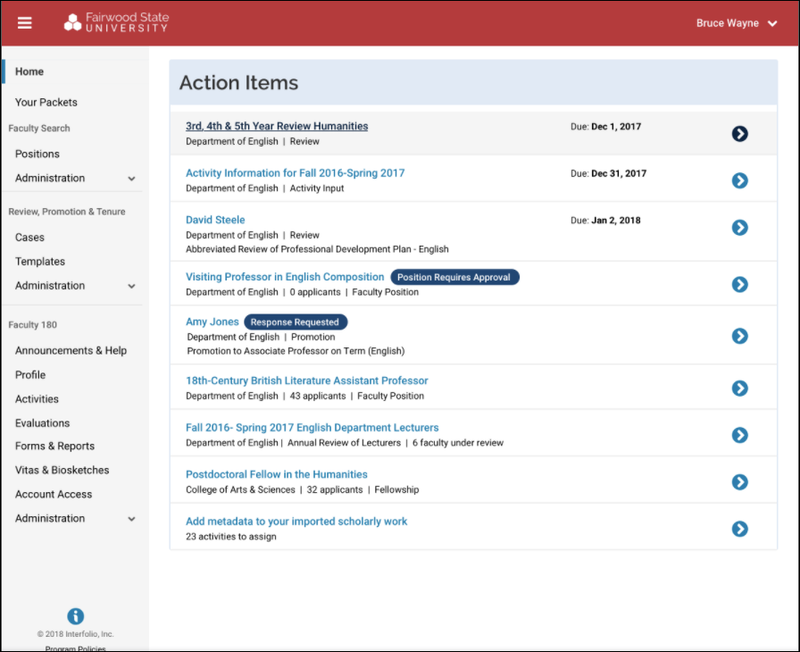 These changes were inspired by the navigation within the Faculty180 Environment for the standard faculty user, so adapting to the changes will not be difficult. To help prepare, below is a list of changes specific to the Faculty180 environment. Recognizing that many institutions have their own support network, Institutional administrators of the Faculty180 product have been provided access to a general demo database or alpha-environment to become familiar with the upcoming changes before they are released to all users. All user interfaces displayed here are in early stages and are currently in development. The final release may change from what is displayed in this article. As the release date approaches we will share more up-to-date information. Below is the Faculty180 segment of the new Navigation bar. If your institution only uses Interfolio Faculty180, than your users will only see relevant Faculty180 options. Below is an example of the navigation bar pending proper permissions. You should note a few important differences in this new navigation bar, when compared to the previous Faculty180 navigation bar. It will connect all Interfolio products from one toolbar, only the relevant Interfolio products will be displayed. There is no longer two-tabs for 'Faculty' and 'Admin'. Instead users, with the proper permissions, will access the 'Admin' options via the collapsable Administration pane from the Navbar. There is a new 'Announcements & Help Page' that will contain Faculty180 Announcements and FAQs. If multiple Interfolio products are maintained, all will become navigable from the single sidebar. The relevant Administration Sections have been made to expand and collapse. The updated dashboard tool will be focused on the users's 'Action Items', formerly 'To-Dos'. No matter what Interfolio product you use, users will be notified in-product of the action items in this location. From there, users will use the navigation bar to dive into each section of the Interfolio platform. As displayed in the image above, the Quicklinks tool will not be available from the Dashboard. This is because the Quicklinks tool was developed solely within Faculty180, and currently only function within Faculty180. Meaning that at the initial release the Quicklinks tool will not save links to Interfolio Review, Promotion, and Tenure, Interfolio Dossier, or Interfolio Faculty Search. The Search Tool section and Logi Tool section (formerly Manage Your Data) were both on the Faculty180 dashboard. 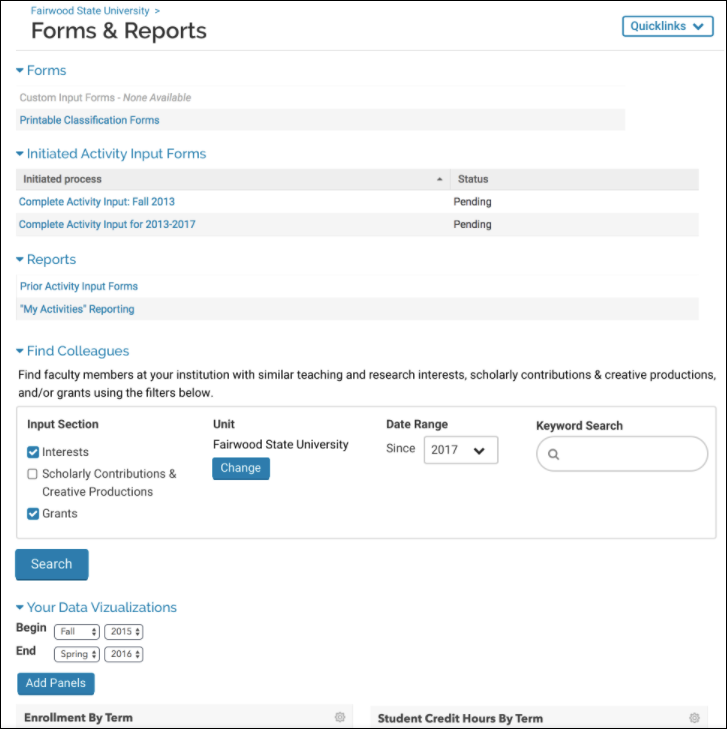 Since these were Faculty180 specific tools, in the alpha, we have placed them on the Forms & Reports page for faculty who want to be able to run reports on faculty interests or work, or view visualizations of their own work. Introducing the 'Announcements & Help Page'. This page will be available to all Faculty180 users from the navigation bar. 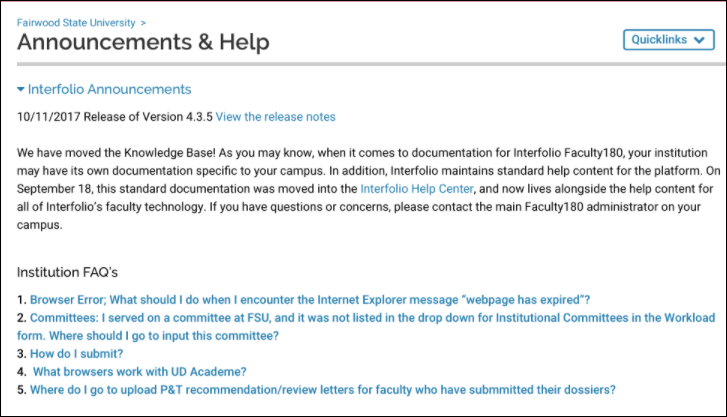 This new page will contain the Announcement panes, which was formerly located at the bottom of the Faculty180 dashboard, and also the Institution FAQs, which formerly was available via the User Menu, in the top right corner.